Oh I am so glad Friday is here! I have a jam packed weekend - literally three party/get-togethers tomorrow and then Sunday a photo shoot for apt22 and working on the couch. What are your plans for the weekend? Here are some of my favorite finds from around the web this week. See you back here on Monday! Have a fabulous weekend. 1. DIY your heart out with this project. This would be a perfect project for an outdoor garden wedding or a chic backyard get together! 2. In love with this skirt project, made from thrifted material. This is such a great throwback to 1960s pencil skirts. 3. What a great birthday surprise. I want something like this for my birthday next year! 4. 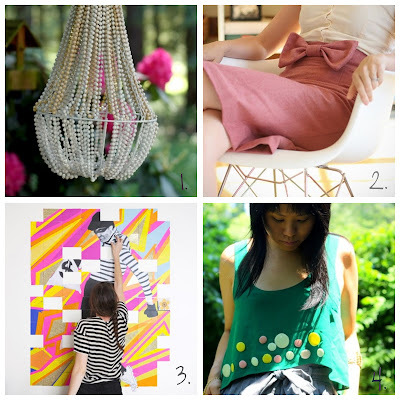 A little blog love - I'm totally hooked on the-ensemble-project...some great weekend reading!